Invited Lectures. Catalysis on ZSM-5 zeolites modified by phosphorus (G. Öhlmann et al.). New directions in zeolite catalysis (J. Weitkamp). Zeolites as catalysts for alkane oxidations (R.F. Parton et al.). Sorption and separation of binary mixtures of CH4, N2 and CO2 in zeolites (L.V.C. Rees). Use of ZSM zeolites in the liquid phase separation of alcohols (R. Schöllner, W.D. Einicke). Basic principles and recent results of 1H magic-angle-spinning and pulsed field gradient nuclear magnetic resonance studies on zeolites (H. Pfeifer et al.). Spectral study of Lewis acidity of zeolites and of its role in catalysis (V.B. Kazansky). Comparative measurements on acidity of zeolites (H.G. Karge). Acidity and basicity in zeolites (D. Barthomeuf). Matrix vs zeolite contributions to the acidity of fluid cracking catalysts (R. v. Ballmoos, C.-M.T. Hayward). ZEOSORB HS-30 - a template-free synthesized pentasil-type zeolite (K.-H. Bergk et al.). Selective conversion on syngas to hydrocarbons by zeolites (H. Tominaga et al.). 129Xe NMR of adsorbed xenon for the determination of void spaces (Q. Chen et al.). Diffusion of hydrocarbons in A and X zeolites and silicalite (D.M. Ruthven et al.). Atlas of zeolite structure types: Past - Present - Future (W.M. Meier). Zeolites as membranes: The role of the gas-crystal interface (R.M. Barrer). The roles of metal and organic cations in zeolite synthesis (D.E.W. Vaughan). Temperature dependence of nucleation of zeolites in alkaline aluminosilicate gels in hydrothermal crystallization conditions (S.P. Zhdanov et al.). Submitted Papers. Catalysis (14 Papers). Sorption and Diffusion (5 Papers). Synthesis and Structure (16 Papers). Acidity (6 Papers). Author Index. Subject Index. 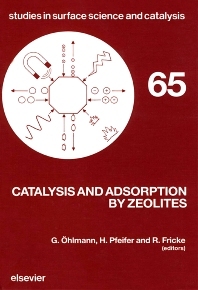 The proceedings of ZEOCAT 90 reflect the wide-ranging aspects of the rapidly expanding field of zeolite science and technology. The invited plenary lectures given by eminent zeolite scientists summarize current knowledge and address topical areas of zeolite research, including a contribution on the use of zeolites as membranes. The field of investigations described in the submitted articles in this volume covers a wide area of problems ranging from the influence of the synthesis process on the properties to questions of acidity, adsorption, diffusion, and catalysis. Of special interest are the newly developed applications of zeolites in the synthesis of fine chemicals, the use of zeolites for sensors and solid electrolytes, and the sophisticated zeolite-based separation processes.